Last night, Google reported financial results for the second quarter of 2010. While revenue growth was up 24% year over year, revenue was fairly flat compared with Q1 of 2010. Moreover, earnings fell short of average street estimates sending Google down $20 per share (4%) in the aftermarket. Based on current estimates (which might change tomorrow), Google currently trades at 18 times the street average for 2010 earnings, and 15.5 times the same number for 2011. These represent price/revenue multiples of 7.5 and 6.5 for 2010 and 2011 respectively. For a long-term tech investor, these valuation multiples seem surprisingly low for a proven market leader. What gives? Over the past 30-40 years of tech investing, public investors have come to expect the market leaders in each sector to trade at valuation premiums. On average, these market leaders have had respectful PE multiples of over 30X forward 12-month earnings, and price/revenue multiples in the 6-10X range. As examples, Microsoft and Cisco held 30X+ PEs for many, many years. With this as a backdrop, many are surprised that Google, which is relatively young at only 12 years old, is burdened with a PE multiple that is typically associated with the senior-citizens of tech leadership. Google’s forward current PE multiple isn’t remarkably higher than Microsoft (12.75) or Cisco (15). While there is no exact science for what leads to higher PEs, there are many theories. Some argue that PE’s relate to growth. 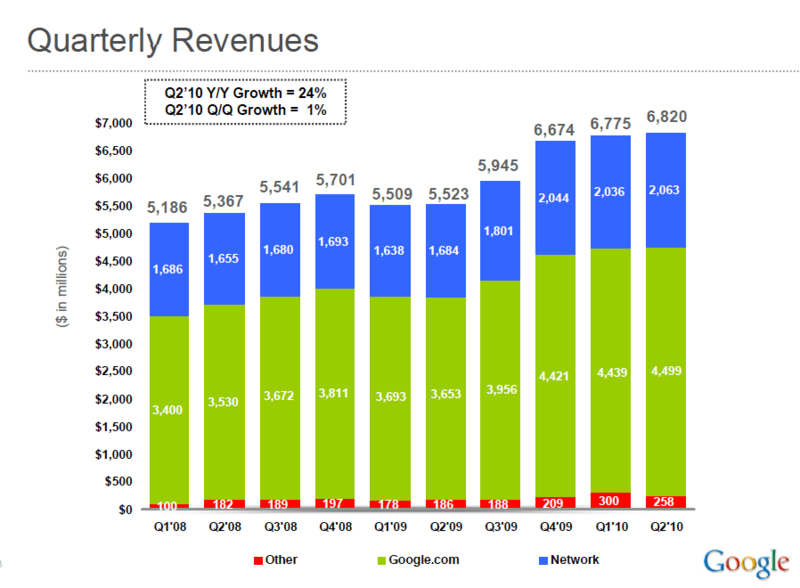 That said, Google’s growth is much higher than Microsoft and Cisco, and yet it doesn’t have that much higher a multiple. My good friend, Mike Mauboussin of Legg Mason, suggests that higher PEs reflect more concrete competitive advantages. I have always been a huge fan of this theory he calls CAP (which stands for Competitive Advantage Period). It also dovetails nicely with Warren Buffet’s competitive moat theory. However, when I look at Google, I see a company that is well positioned strategically. All attempts at dislodging their leadership have been unsuccessful to date. As such, I don’t think they suffer in this area. One other area typically cited is the more amorphous category of “execution.” I also have a hard time seeing this as the culprit, as Google’s recent execution on Android is pure genius. Moreover, the Google Apps progress is extremely impressive. So if its not growth, competitive position, or execution, what is the shortcoming that hurts Google’s valuation? Believe it or not, the problem is that their initial business model was “too good.” Before I explain take a look at the included chart. Microsoft was founded in 1975, it went public in 1986, reached $10B in sales in 1997, and fell below 20% growth in year 2000. Google was founded in 1998, went public in 2004, hit $10B in sales in 2006, and fell below 20% growth in 2009. So it took Microsoft 22 years to hit $10B in sales. Google did it in 8 years. Resultantly, Microsoft had growth of greater than 20% for 26 years; Google for only 11. I would argue the reason for the noted disparity is pricing optimization and pricing power. When Microsoft first established DOS as a market standard, they reaped about $10/PC in royalties. By the heyday of Windows NT, Microsoft was receiving well over $120/PC in the enterprise. Additionally, they layered in Microsoft Office on top of the OS, which took revenue/PC well north of $200. That’s a 20X increase from where they started. Google’s brilliant bid/market based ad product optimized pricing remarkably quickly. As such, Google reached $10B in revenue in about 3X more quickly than Microsoft. Unfortunately, this coin has two sides. With its ad optimization engine so amazingly efficient, Google has no obvious pricing power against its current installed base. There is simply no way to “double” the amount of spend from each customer, much less a way to take it up 20X. Additionally, they have not yet identified a product that would represent the Google’s version of Microsoft Office in terms of revenue leverage. The Enterprise Apps offering is phenomenal, but the numbers are simply too small relative to search. More importantly, the Entprise App product does not “sit right on top of” the search franchise (as Office was to Windows), limiting the ability to leverage the success of one product into the other. Of course, there is little reason to weep for Google. As mentioned earlier, they appear to be rocking in many areas. Google mail and calendar are now used by over 2 million unique organizations. Also, the execution of the Andoid team will be talked about for decades to come. And even though they may be limited in their price leverage on core search advertising, they still have that blank wide open home page, that I suspect is at least $1 billion in forgone annual ad revenue.